How to download a Moovly video? 'Downloading' or 'exporting' your Moovly content is only possible with all a paying Moovly subscription or with a Free Education plan. If you are still in Free Trial, you should first upgrade your subscription. Alternatively, you can also publish your content to the Moovly Gallery and share that public link with your audience. 1. Go to the 'My Projects' folder of your Dashboard. To the right of the player, you'll find a couple of export options, such as Download and Publish. 2. Click the 'download as video file (MP4)' button. 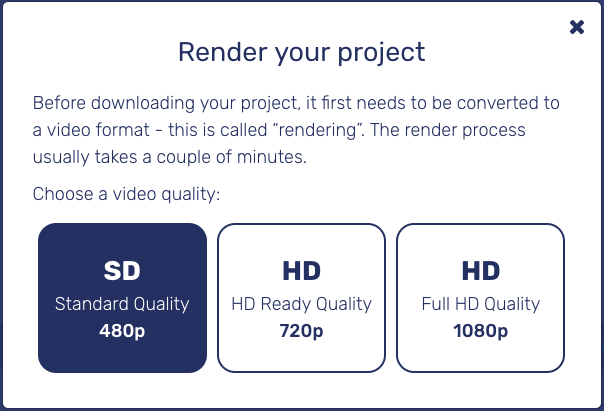 Please note that render time can depend on the chosen video quality, the complexity and length of your video and on the current render queue on Moovly's servers. Typically, short videos (e.g. 30 seconds) in SD quality take a few minutes to render. Long videos (e.g. 3 or more minutes) in HD 1080p quality may take up to an hour or longer to render. When you've made updates to your project, or when you require multiple video resolutions, you can render new versions. 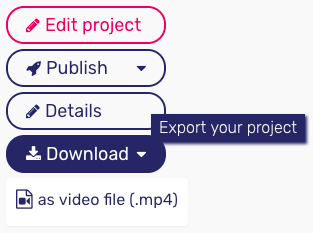 Your previously rendered versions will still be preserved for a while and stay available in the dropdown list of the Download button.